This site is dedicated to the art of Victorian & Edwardian crochet. Along with other crochet products, we offer instruction books containing crochet patterns for very elegant bead crochet purses, crocheted amulet bags, and crocheted chokers. We also offer free crochet patterns and a wonderful product called a Bead Spinner, which allows you to thread approximately 3 hundred beads onto your crochet thread every 60 seconds, making bead crochet so much easier! See our featured crochet products on this page. Don't forget to browse our product catalog. Over the years I've collected many antiques, but never with any true understanding of how old any particular piece was or from which period in history each originated. I only knew that every acquisition spoke to me in a language I couldn't resist! As the years passed, and my eclectic collection grew, I became aware that my most treasured pieces had actually come from several different, though sometimes overlapping, periods in history. In particular, the Regency, Victorian, Pre-Raphaelite, Bohemian, Art Nouveau, Edwardian, and Arts & Crafts eras each struck a resounding chord. These brief intervals in time became my passion, and my passion became my inspiration. The elaborate costumes of these various periods - specifically, the crocheted and beaded accutrements and adornment women wore or carried - have captivated me. 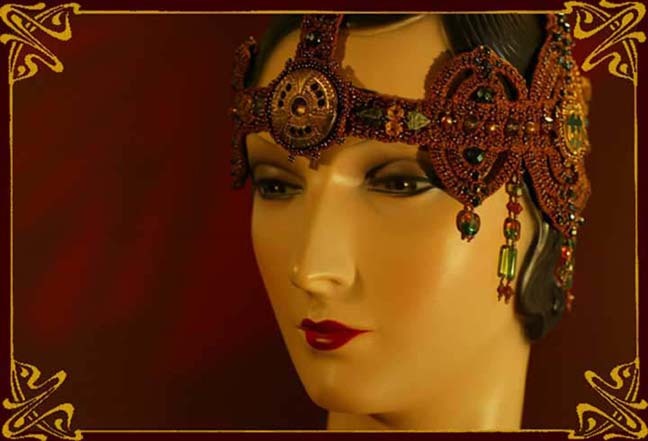 I searched for years to find replicas or at the very least, photographs of these intricately designed pieces. Eventually, the realization came to me that the majority of these objects existed only in private collections or museums (or in theatre costume departments), and if I wanted to own and wear anything like them, I would have to design them myself! Now, I specialize in heirloom quality reproduction pieces from these fascinating years, and have designed several romantic styles as Bridal Accessories. By using a basic theme, and merely altering color and embellishments, my patterns can be adapted to work with nearly any style clothing, from elegantly classic to retro, Gothic or punk! Along with examples of my finished work, on this site you can find instruction books containing many of my designs, as well as pattern books and videos by other designers for crochet and bead crochet purses and amulet bags. Kits for some of my designs are available, as are many of the supplies I use from pearl cotton and crochet thread to cameos, tools, and vintage findings. I am also a distributor of a wonderful product called the Bead Spinner which allows you to thread approximately 300 beads onto your crochet or beading thread every 60 seconds. I hope you enjoy your visit. Please come again soon. please join our email group and we will keep you posted.